Today's botanical menu features some major bulb-a-liscousness. 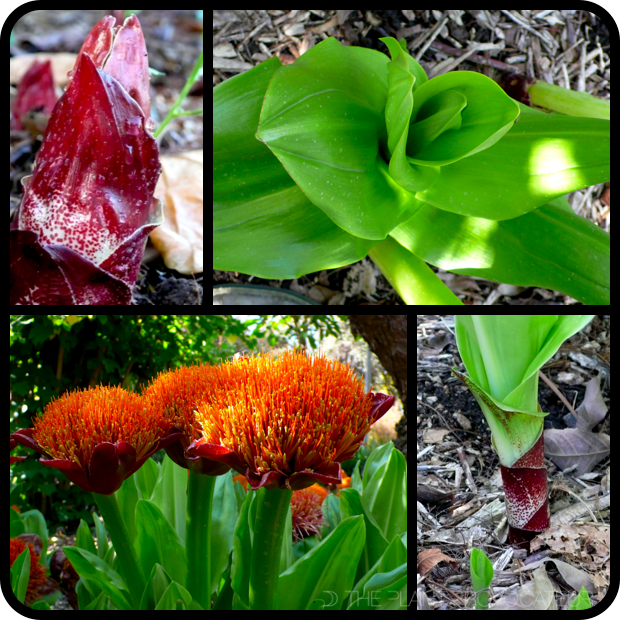 Let me introduce you to Scadoxus puniceus 'Magnificus' other wise known as the Royal Paintbrush or Paintbrush Lily. Allow me to set the scene for you. It's winter. All is quiet in the coastal bushland, ravines, and forests of the southern and eastern capes of South Africa. Seasonal grasses are beginning to green, leaf litter is caressed by dappled light coming through the tree branches above, and soil filled crevices in rocky outcrops begin to warm in the seasonally changing sun. Suddenly, in all of these areas, there is movement below ground. Large ruby-red reptilian-like protrusions begin to rise from the ground looking like some alien tortoise emerging from its shell. This protrusion is actually a peudo-stem that telescopes 1 1/2 to 2 feet upward revealing a furled bud of cherry colored bracts. These large, colorful bracts open to reveal an explosion of red florets that extend scores of showy stamens bursting with bright orange blazing color. The look is big, bold, and bountiful. Following along after the pseudo-stem are broad, pleated, spear-shape stylin', crisp green leaves. The whole package is strikingly beautiful. Seeing Scadoxus puniceus 'Magnificus' growing live and in concert will leave you absolutely mesmerized. When growing Scadoxus puniceus 'Magnificus' enjoy every moment as it puts on its show. These bulbs are winter dormant, actively grow in spring, and have a short but dazzling bloom period in mid to late spring. They like to grow in part sun and shade situations. Scadoxus puniceus 'Magnificus' also likes regular water during its growing season and does best if left dry during the dormant winter months. It is hardy down to 10 degrees fahrenheit/-12 degrees celsius. Lastly, for amazing results, plant them in the ground or in a container with a fertile, well-draining soil. When spring comes and the ground begins to warm up, these spectacular plants will make their presence known. Did I hear someone say, "Release the Kraken"? By all means, let this beautiful beast burst forth and announce that spring is here. Discover Scadoxus puniceus 'Magnificus' and, I believe, you too will develop a serious bristle brush orange cherry crush!